Can you believe this? Two major national magazines published an "Art Issue" this month. Which one is better? To give you a hint, just look at the covers. 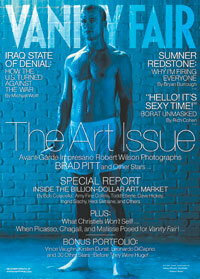 Vanity Fair opted for the celeb cover of Brad Pitt (although the image is by Robert Wilson), whereas the W cover is a collaboration by artist Richard Tuttle and photographer Mario Sorrenti. 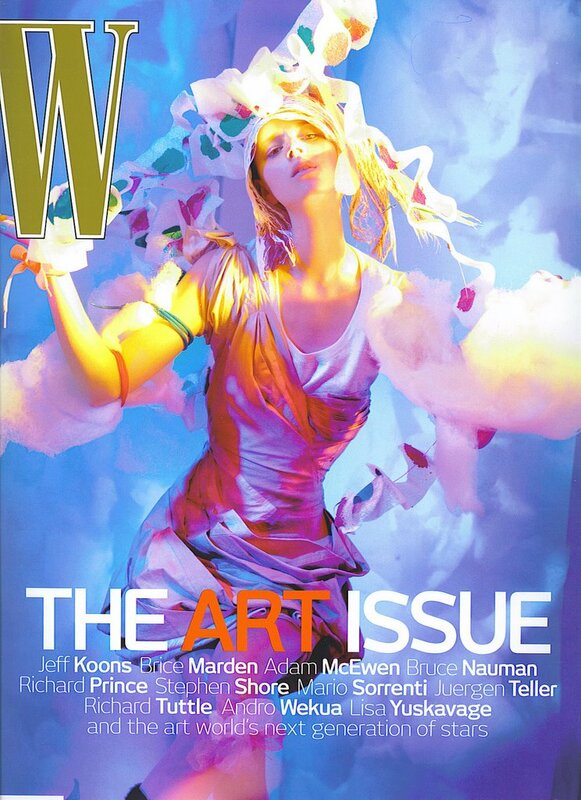 W magazine includes many more photographs and spreads of the actual artwork by the up-and-comers, while Vanity Fair printed just the artist's photo and a blurb of a bio. Both magazines, however, do agree on one thing: Kristen Baker is a hot new artist. Vanity Fair gives us a pinup pose, while W reveals a more demure image of the artist.